The roofer used to be always friend and assistant of people who needed a solid roof over their heads. Nowadays, style and design are much more important; nevertheless the roofer operates with his clients offering them latest technologies, in order to construct the roofs more effectively. We are specialists in dealing with roof covering technics, wall and waterproofing technics as well as the latest technologies such as installing solar collectors at an efficient consumption of electricity. The roofer qualified craftsman company Balluff – Your specialist for all fields! 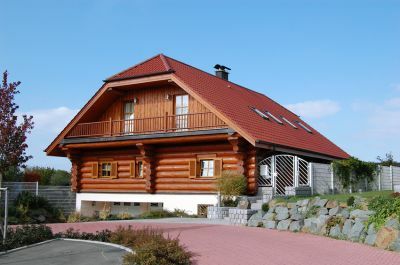 You will find different methods of roof covering technics depending on which part of Germany you live. Such as the “Reet roof” in Northern Germany or the “Schist” in the Low Mountain Range. The roof itself consists of various unimaginable types. However, one aspect is common: Houses have a lively character thanks to their roof which assures dry and secure protection in rainy seasons. The roofer furthermore is responsible for reconstructions of older roofs that have to be renewed or repaired. For that the corresponding competences are essential which the roofer can acquire and extend step by step. Regarding roofing tiles that will no longer be produced, he has to take care of obtaining them from somewhere else, respectively to produce them even by himself. On reconstruction of a roof, he also has to check insulation and waterproofing as well as the stability of the roof, creating a basis of maintenance in future. Lightning strikes often destruct the whole circuit of a building. With the help of lightning arresters this can be avoided. The installation of those lighting arresters is one of the tasks of the roofer. Basically the types of roof covering remain unmodified. Except the latest technologies, making roofs more secure and maintainable. The roofer is always interested in meeting this standard in order to guarantee for a secure roof.